intro Amanita rhoadsii has very narrow spores, which commonly may be more than 4 times as long as they are wide. cap The cap is white and 50 - 100 mm wide. gills The gills are white to cream to yellowish cream, adnate or adnexed, and moderately crowded to crowded. The short gills are subtruncate to attenuate. stem The exannulate stipe is 70 - 180 × 7 - 20 mm and, at first, densely floccose; at the stipe base is an elongate bulb. There are rarely any volval remnants at the top of the stipe's basal bulb. odor/taste Amanita rhoadsii has a distinctive odor (some authors call it "old ham"), not of chlorine, but quite difficult to describe. A yellow-staining var. (A. rhoadsii var. flavotingens Bas) has been described. spores The spores measure (9.8-) 10.1 - 14.5 (-15.5) × (3.5-) 3.8 - 4.8 µm and are cylindric to bacilliform (even, infrequently, more than four times longer than wide!) and amyloid. Clamps are present on bases of basidia. discussion Because, the closely related A. subsolitaria (Murrill) Murrill is occasionally found strongly staining yellow and obviously parasitized by something, it would be a worthwhile project to find yellow-staining A. rhoadsii and examine them for an environmental cause of the reaction. The yellow staining members of A. rhoadsii were placed in A. rhoadsii var. flavotingens Bas. 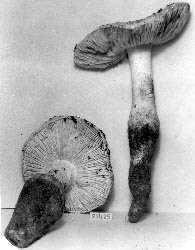 Amanita rhoadsii and A. subsolitaria make up Bas' stirps Rhoadsii. 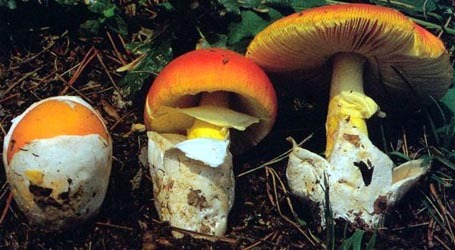 Amanita rhoadsii is often associated with oak and pine. author (Murrill) Murrill. 1939. Bull. Torrey Bot. Club 66: 37. ≡Venenarius rhoadsii Murrill. 1939. Bull. Torrey Bot. Club 66: 30.
etymology genitive of Latinized name; hence, "Rhoads'" or "of Rhoads"
type studies Jenkins. 1979. Mycotaxon 10: 188.
revisions Bas. 1969. Persoonia 5: 496, figs. 262-266. The following material not directly from (Bas 1969) or another cited researcher is based on original research by R. E. Tulloss. pileus Bas (1969): 50 - 100 mm wide, white, convex to plano-convex, shiny, "probably subviscid"; context white, unchanging; margin nonsulcate, appendiculate; universal veil as large, slender, friable, conical warts when young "under favorable conditions," soon "becoming completely pulverulent-subverrucose or...breaking up into some pulverulent crusts or many small pulverulent patches or very small flocculose-pulverulent conical warts. RET: 75 mm wide, white, convex, dull; context white, unchanging when cut or bruised, 13.5 mm thick at stipe; margin nonstriate, appendiculate, have a continuous sterile rim 2 - 3 mm wide; universal veil as thick white covering with occasional white peaks, ranging from felted to floccose or pulverulent, detersile at least in part, unchanging when cut or bruised. lamellae Bas (1969): adnexed to adnate, moderately crowded to crowded, white to cream, "rather broad," with flocculose edge; lamellulae with shortest subtruncate, others attenuate. RET: adnate with short decurrent line on stipe apex, subcrowded to crowded, cream in mass, pale cream in side view, unchanging when cut or bruised, up to 10.5 mm broad, edge minutely pulverulent; lamellulae rounded truncate to subattenuate to attenuate after a subtruncate step. stipe Bas (1969): 70 - 180 × 7 - 20 mm, white, sometimes with subapical fugacious flocculose annular zone; bulb up to 35 mm wide, slender and deeply rooting or slenderly fusiform or fusiform or napiform; context white, unchanging; exannulate; universal veil apparently absent or as vague flocculose-felted ridge at top of bulb. RET: 93 × 14.5 mm, white, with detersile dense flocculence, cylindric, unchanging when bruised, sometimes having subapical densely floccose zone; bulb 43 × 26 mm, fusiform to subnapiform, rooting, dog-legged; context white above, yellowish below, pale yellowish when bruised, solid; exannulate; universal veil in many concentric rings of small scales on lower stipe, extending at least as far down as broadest point of bulb. odor/taste Bas (1969): Odor of "chloride of lime" or "old ham." Taste not recorded. RET: Odor of “chlorine.” Taste not recorded. pileipellis Bas (1969): poorly developed, gelatinizing near surface only in age, consisting of interwoven hyphae 3 - 6 μm wide. pileus context RET: filamentous, undifferentiated hyphae 2.8 - 11.9 µm wide, plentiful, branching; inflated cells terminal, singly or in short chains, ellipsoid to elongate to clavate to broadly clavate to broadly ellipsoid, up to 135 × 88 µm, dominating, walls thin to slightly thickened; vascular hyphae 2.8* µm wide, uncommon; clamps prominent, common. lamella trama Bas (1969): bilateral; clamps present. subhymenium Bas (1969): ramose to inflated-ramose. basidia Bas (1969): 40 - 55 × 8 - 10 μm, 4-sterigmate; clamps present. RET: ?? ; clamps prominent and plentiful. universal veil Bas (1969): On pileus: yellowish in alkaline solution; filamentous hyphae rather scarce (in type) to rather abundant, up to 10 μm wide; inflated cells predominantly ellipsoid or elongate-ellipsoid or pyriform or clavate or subcylindric (up to 120 × 35 μm), with few globose or fusiform or irregular (up to 60 × 60 μm), in erect parallel rows; vascular hyphae scattered. RET: On pileus: gelatinizing at surface; filamentous, undifferentiated hyphae 2.0 - 15.0 µm diam., branching, with walls thin or slightly thickened; inflated cells with periclinal orientation [? ], collapsing and disordered, often containing a pale brown pigment in exsiccatum, terminal singly or (often) in short chains, pyriform to ellipsoid to broadly clavate to fusiform-elliptic to ventricose-rostrate, up to 118 × 21 µm in fresh material, up to 135 × 46 µm in exsiccatum, with walls thin or slightly thickened; vascular hyphae 1.7 - 6.6 µm wide, branching, infrequent, but locally common. From scales on lower stipe: ??. stipe context Bas (1969): longitudinally acrophysalidic. lamella edge tissue Bas (1969): as rather broad strip; filamentous hyphae present; inflated cells clavate to pyriform, 15 - 55 × 10 - 25 μm. Bas (1969): [85/8/8] 10.5 - 13.5 (-15.5) × 3.5 - 4.5 μm, (Q = 2.6 - 4.2; Q = 3.0 - 3.4), colorless to yellowish, thin-walled, amyloid, cylindric to bacilliform, sometimes curved; apiculus not described; contents guttulate, refractive; color in deposit not recorded. from type study of Jenkins (1979): [-/-/1] 10.9 - 12.5 × 3.1 - 3.9 μm, (Q = 2.70 - 3.77; Q = 3.24), hyaline, thin-walled, amyloid, cylindric to bacilliform, often adaxially flattened; apiculus sublateral, cylindric; contents guttulate; color in deposit not recorded. 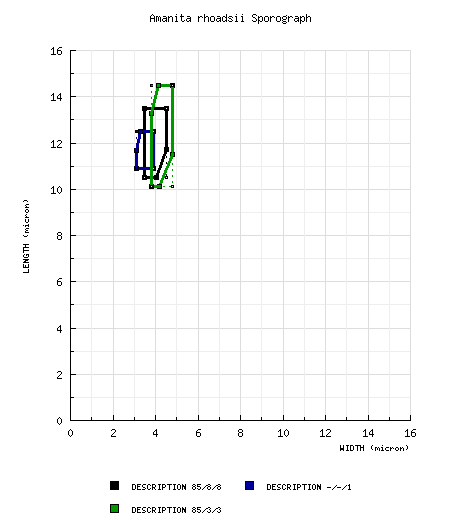 composite of data from material revised by RET: [85/3/3] (9.8-) 10.1 - 14.5 (-18.5) × (3.5-) 3.8 - 4.8 µm, (L = 11.7 - 13.9 µm; L' = 12.1 µm; W = 4.1 - 4.3 µm; W' = 4.3 µm; Q = (2.22-) 2.40 - 3.49 (-4.14); Q = 2.66 - 3.25; Q' = 2.82), hyaline, smooth, thin-walled, amyloid, cylindric, slightly curved; apiculus sublateral, cylindric, proportionately small; contents granular to multiguttulate; color in deposit not recorded. ecology Bas (1969): Terrestrial in deciduous (often Quercus) and coniferous woods in south-eastern USA. Mississippi: In sandy soil of bottomland hardwood forest, no rain for a week, nearby trees include Acer rubrum, Pinus elliotii, Quercus muehlenbergii, and Ilex sp. material examined Bas (1969): U.S.A.: ALABAMA—Lee Co. - Auburn, 1.viii.1955 L. R. Hesler & Moore 21958 (TENN). FLORIDA—Alachua Co. - Gainesville, 2.vii.1944 W. A. Murrill F 38904 (FLAS). Hillsborough Co. - Tampa, 10.x.1948 G. F. Weber [Murrill] F 8568(ed.—out of sequence?)] (FLAS). Leo Co. - Tallahassee, 30.vii.1954 L. R. Hesler & Campbell 21429 (TENN; L). Putnam Co. - Lk. Rosa, 8.ix.1938 L. & A. S. Rhoads s.n. [W. A. Murrill} F 18125 (holotype, FLAS); ca. Melrose, 30.viii.1939 A. S. Rhoads s.n. [W. A. Murrill] F19911 (FLAS). Wakulla Co. - St. Marks, 29.vii.1954 L. R. Hesler & Campbell 21429 (TENN; L). SOUTH CAROLINA—Horry Co. - SW of Myrtle Beach, 28.vii.1948 W. C. Coker 14442 (NCU). from type study of Jenkins (1979): U. S. A.: FLORIDA— Putnam Co. - Lake Rosa, 8.ix.1938 A. S. Rhoads F. 18125 (holotype, FLAS). U.S.A.: FLORIDA—Palm Beach Co. - W. Palm Beach, Lytel Pk., vii.2000 Hanna Tschekunow s.n. (RET 314-7). MISSISSIPPI—Perry Co. - Black Creek Wilderness Area, 16.vii.1987 T. Baroni & D. Desjardin s.n. [Tulloss 7-16-87-H] (RET 060-3). TEXAS—Hardin Co. - Larsen Sandyland Sanctuary, off St. Hwy. 327, 27.viii.1989 D. P. Lewis 4310 (F? ; RET 146-1). discussion Bas (1969): "The long pointed warts on the cap mentioned by Murrill in the protologue have disappeared from the two dried type specimens nearly completely. Their caps are now entirely pulverulent with only scattered remnants of warts are in folds and wrinkles. In most of the other collections studied conspicuous warts are also lacking, except in Rhoads F 19911, where quite number of them, up to 4 mm long and 3 mm wide, have been preserved. These warts are rather friable and still more so is the layer of volva on which they are situated. Apparently that is why in most preserved specimens (and perhaps also in many specimens in the field) the large warts have disappeared and the caps are merely pulverulent. Fairly often the remaining pulverulent layer of the volva breaks up again into large to small patches or even very small, subconical warts, showing a somewhat shiny pileipellis between. In young stages the pileipellis is very difficult to locate but with age it gelatinizes slightly at the surface when it is exposed. "The inflated cells in the warts on the cap are very clearly arranged in erect, parallel rows. More or less the same type of arrangement is to be seen in the more pulverulent basal layer of the volva on the cap. "The slender, rooting base of the stem of the largest type specimen [Bas 1969: fig. 265] is rather atypical for the species. Usually there is a distinct, rather abrupt, fusiform to napiform bulb with a more or less rooting base. However, all transitional forms are present in the specimens studied. 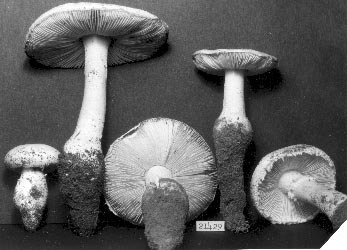 "Amanita rhoadsii differs from...A. subsolitaria,...occurring in the same area, by its consistently narrower spores (width 3.5 - 4.5 μm against 4.5 - 6 μm), its smell like "chloride of lime," and has larger, more often clavate cells in the remnants of the volva on the cap. "The shape of the spores is similar to that in A. roanokensis, but in that species clamps are lacking and the structure of the volva is different." photo L. R. Hesler (1-2), Florida, U.S.A., with permission of Dr. R. H. Petersen, Curator, L. R. Hesler Herbarium, Univ. of Tenn., Knoxville. RET (3) Gulf of Mexico coastal plain, Mississippi, U.S.A.
select a collection to review/add spore measurements..#808067. L. R. Hesler & Moore, #21958, U.S.A., ALABAMA, Lee Co., Auburn#808068. W. A. Murrill, #F 38904, U.S.A., FLORIDA, Alachua Co., Gainesville#808069. G. F. Weber, #s.n.=>Murrill, U.S.A., FLORIDA, Hillsborough Co., Tampa#808070. L. R. Hesler & Campbell, #21429, U.S.A., FLORIDA, Leo Co., Tallahassee/..#808071. L. & A. S. Rhoads, #s.n.=>W. A. Murrill, U.S.A., FLORIDA, Putnam Co., L..#808072. L. R. Hesler & Campbell, #21429, U.S.A., FLORIDA, Wakulla Co., State Ma..#808073. W. C. Coker, #14442, U.S.A., SOUTH CAROLINA, Horry Co., SW of Myrtle Be..#808074. A. S. Rhoads F., #18125, U.S.A., FLORIDA, Putnam Co., Lake Rosa#808075. Hanna Tschekunow, #s.n., U.S.A., FLORIDA, Palm Beach Co., W. Palm Beach..#808076. T. Baroni & D. Desjardin, #s.n.=>Tulloss 7-16-87-H, U.S.A., MISSISSIPPI..#808077. D. P. Lewis, #4310, U.S.A., TEXAS, Hardin Co., Larsen Sandyland Sanctua..